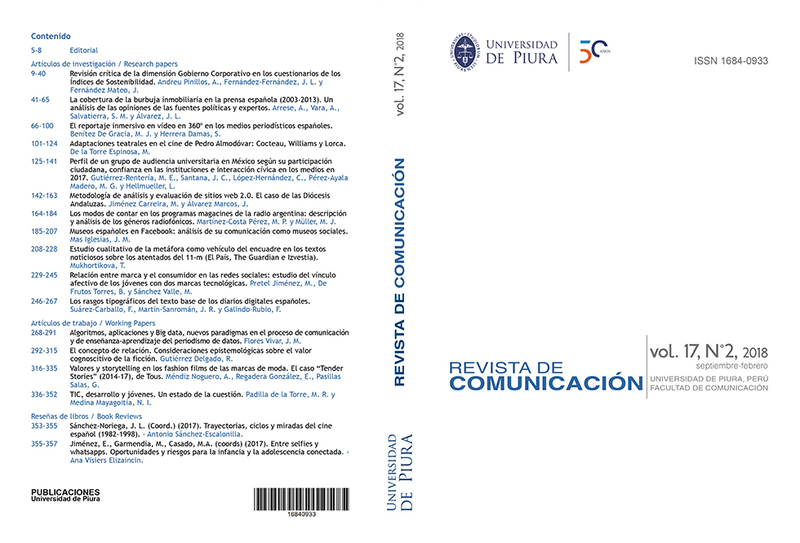 Revista de Comunicación is indexed to important databases. 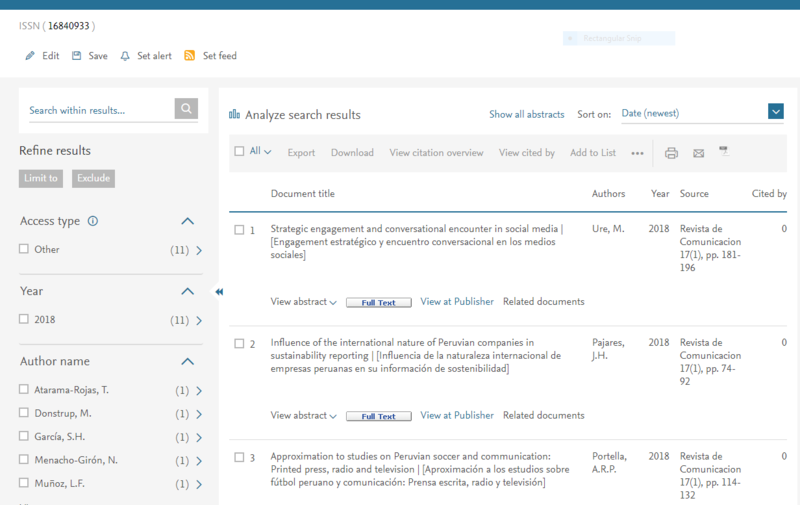 Scopus is the largest database of citations and abstracts of peer-reviewed bibliography: scientific journals, books and conference proceedings. Web of Science is an indexing service for scientific citations based on online subscriptions originally produced by the Institute of Scientific Information, then maintained by Clarivate Analytics, which provides a complete search for citations. SciELO Perú (Scientific Electronic Library Online) is a virtual library that includes a selected collection of Peruvian scientific journals and provides full access to the contents. DOAJ's mission is to increase the visibility, accessibility, reputation, usage and impact of quality, peer-reviewed, open access scholarly research journals globally, regardless of discipline, geography or language. Universidad de La Rioja DIALNET is a portal for the dissemination of Spanish scientific production. 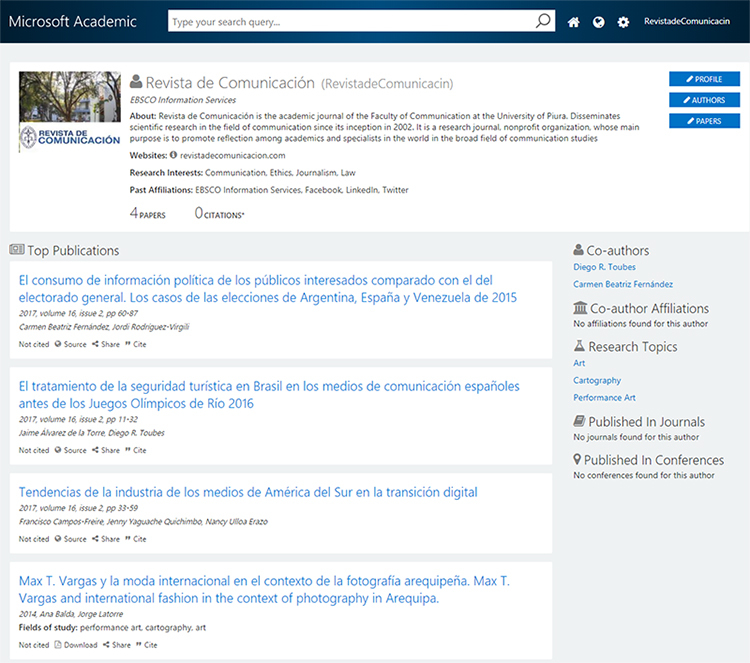 REDIB is an aggregation platform scientific and academic content in electronic format produced in Iberoamerica. Collective catalog of the University Library Network (Catalog REBIUN) gathers bibliographic records of the 76 university libraries and CSIC that are part of this network. 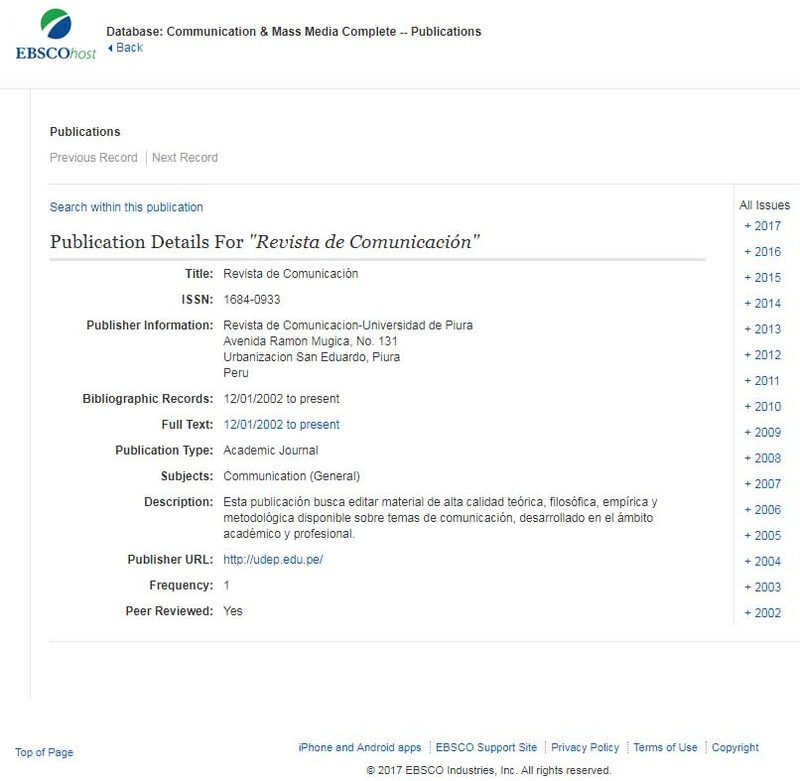 Product from the cooperation of a network of institutions that work collaboratively to collect and disseminate bibliographic information about scientific publications produced in the region. EBSCO Academic Search Complete provides to libraries and research centers a comprehensive set of electronic resources, management tools, full texts and databases. MIAR is updated annually gathers key data for identification and analysis of journals and a support tool to perform assessment work. It is a bibliographic database (of EBSCO) of articles of magazines and international newspapers. 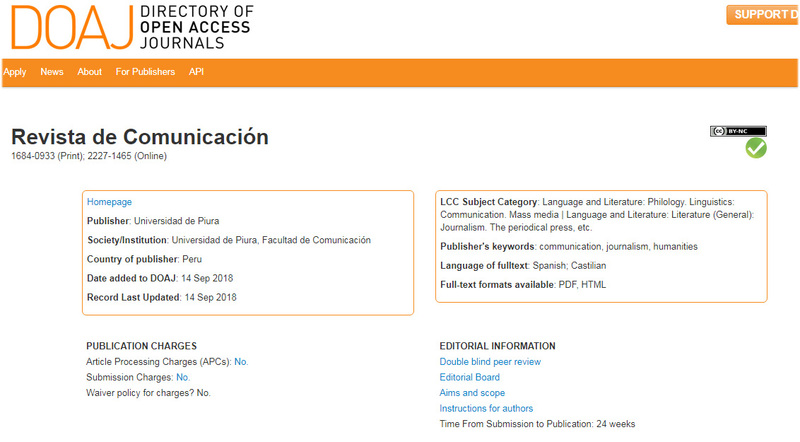 Ibero-American Confederation of Scientific and Academic Associations of Communication. Is an authoritative directory of academic open access repositories. Is a bibliometric tool that seeks to measure the performance of Art, Humanities, and Social Science journals by counting the number of bibliographic citations their articles have received according to Google Scholar..
Is a search engine for scientific articles that allows you to locate references of academic texts. The journals included in this source of information have a specific page, in which the published articles are grouped, in addition to showing the number of citations. CIRC is a common measurement tool that is used by research groups to make comparisons and share information. LatinREV is the cooperative network of journals and associations of academic journals in the field of social sciences and humanities. The largest network of university cooperation with the patronage of Banco Santander. International organization that groups to more than 258 Schools of Communication, of 23 countries of Latin America and other regions. Crossref is an independent publisher association whose aim is to promote the development and cooperative use of new and innovative technologies in order to accelerate and facilitate academic research. Manages Digital Object Identifier (DOI) services and registration.